Don’t let the myths about carpeting prevent you enjoying it in your home! Carpet is an incredibly popular flooring option, but it’s also incredibly misunderstood. Millions of Americans have carpeting in their homes, so you’d think that people would understand everything there is to know about carpet, but that’s simply not the case. The reality is that carpeting is a wonderful option for many reasons. It’s cozy, comfortable, affordable, provides insulation, helps to filter out the air and is available in more colors and styles than you could ever dream of! But, the fact of the matter is that some people don’t even consider carpeting for their home because they believe all of the common myths and misconceptions about it. 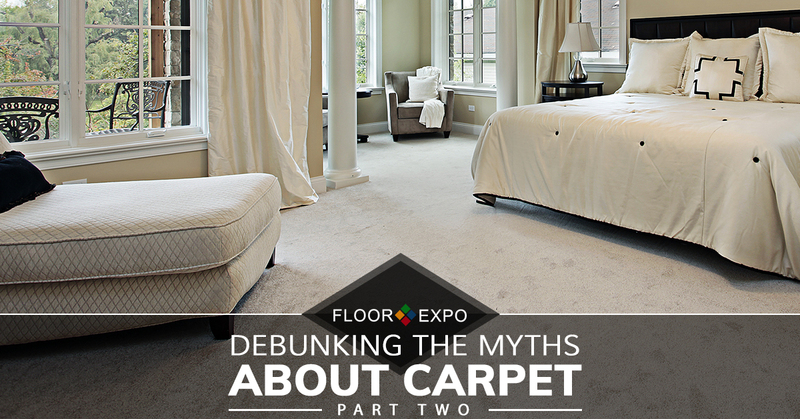 That’s exactly why the professional carpet installers from Floor Expo debunked a few of the most common carpeting myths in our last blog. Check it out if you haven’t already, and keep reading to learn more. Myth #5. Carpet emits a lot of harmful chemicals into the air. There are many things in your typical home that emit volatile organic compounds (VOCs) for a time, including furniture, paint, varnishes and more. VOCs can cause both short-term and long-term health consequences, and many people believe that new carpet is a major emitter of VOCs. But, luckily, that simply isn’t the case. In fact, the VOC emissions from new carpet are the lowest of most common household products. Plus, any VOCs that are emitted from your carpet will dissipate in the first 24 hours — even faster if your home is properly ventilated. Myth #6. The thicker the carpet, the more durable it is. If you’re interested in thick carpeting because you enjoy the ultra-plush feel of thick carpet between your toes, you’re on the right track. But, if you’re interested in thick carpet because you believe that it will be a more durable option, you should think again. In reality, carpets made with longer yarns are more prone to matting. And, if you want the most durable carpeting option, your best bet is to choose a carpet that is more dense, regardless of the thickness of the strands themselves. Myth #7. You’ll save more if you choose the cheapest carpeting. Like with everything else in life, the quality of carpeting can vary dramatically. And, as a general rule, the cheapest options aren’t typically the best options when it comes to both quality and longevity. On average, carpeting is designed to last for 10 years, but some of the cheapest carpeting is designed to last as short as three years, while some of the most expensive carpeting is designed to last as long as 36 years. There’s no point in saving money now if it means that you’re going to have to pay for the cost of your carpeting several times over the life of carpeting that is pricier upfront. So, when it comes to the cost of your carpeting, it’s in your best interest to think beyond your initial investment. Myth #8. Cleaning your carpet too often will cause it to wear out faster. The only thing that you have to do to keep your carpet looking great is to vacuum regularly and get it professionally cleaned every year — nothing more and nothing less. However, some people choose not to vacuum so often or ever get their carpeting professionally cleaned because they believe that it will cause it to wear out faster. But, in reality, not cleaning the carpet is what will make it wear out faster. Dirt exists inside a carpet that hasn’t been cleaned, whether you see it or not, and it’s abrasive in nature. 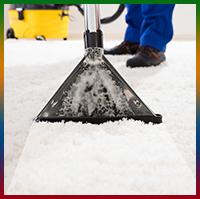 Every time you walk on the carpeting, you are grinding that abrasive dirt deeper and deeper into its fibers, where it can tear and break down your carpeting, one fiber at a time. Are you ready to stop believing the myths and start enjoying the benefits of carpeting in your home? If so, look no further than New Jersey’s premier flooring professionals — Floor Expo Inc. We’ve been meeting all of your flooring needs for the past 30 years, and we offer a huge selection of carpeting options for you to choose from. Stop by our showroom in Fairfield today, or contact us to schedule your free design consultation!